I have written about two Rioja Reserva’s on my website; Mauro 2014 and Selección Especial 2011 Muga. Both cost more than £20 per bottle so I was pleased to discover a Rioja Reserva for £10 which has many of the qualities of these higher priced Rioja’s just not as elegant and refined. 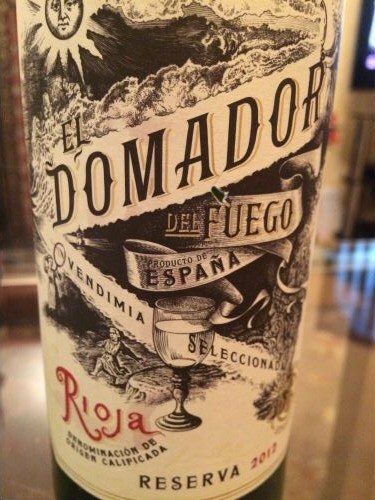 However, for the price Domador Del Fuego Rioja Reserva 2012 is very good value for money. Made from Tempranillo grapes from Rioja, the famous wine region in Northern Spain, this wine won a bronze medal in the 2017 Decanter World Wine Awards and was rated as a ‘Fine example, well above average.’ Domador Del Fuego means ‘The Fire Tamer’ but don’t make the mistake of matching it with spicy food. The cork had a beautiful aroma of coconut which I’ve never smelt in a red wine before and can’t explain! In the glass, the colour was tawny ruby and the wine had good legs which moved slowly down the glass. On the nose, the first aroma was heavy acetone but it was soon superseded by a hedgerow of blackberries and vanilla. On the palate was cherry with a hint of raspberry then liquorice and sweet vanilla. For a wine of this price, the length was very good indeed with a continuous echo of vanilla coming from the 36 months spent in oak. It had high tannin which dried the mouth immediately so it needed food. This wine is 13% alcohol volume. As the wine is such excellent value, I tried it with more foods than usual and had to purchase a second bottle. I tried it with onion bhaji and sweet chilli sauce. Big mistake! For lunch, it was delicious with cheddar cheese and a hunk of fresh crusty bread. As a main meal, I served it with a grilled pork chop marinated in fresh lemon juice, soya sauce, garlic, ginger, honey and finely chopped spring onions served with a roasted red pepper stuffed with couscous containing finely chopped red onion and yellow pepper. The marinade on the chop was too much for the wine but the red pepper matched very well. I kept the stuffed red pepper and swapped the pork chop for a plain, grilled lamb steak. This was a great match. Unlike the more expensive Rioja Reserva’s this one does not cope well with a range of flavours and fat. Match Domador Del Fuego Rioja Reserva 2012 with leaner meat and with foods that are on the sweet side, rather than bitter. The first bottle was given to my husband and the second bottle, I purchased from Tesco for £10.